Whether the station message is to be transmitted at all. Whether an automatic Maidenhead-format location or timestamp should be prefixed to the message. The actual text message to be sent. Which digipeat paths should be used for the status message. 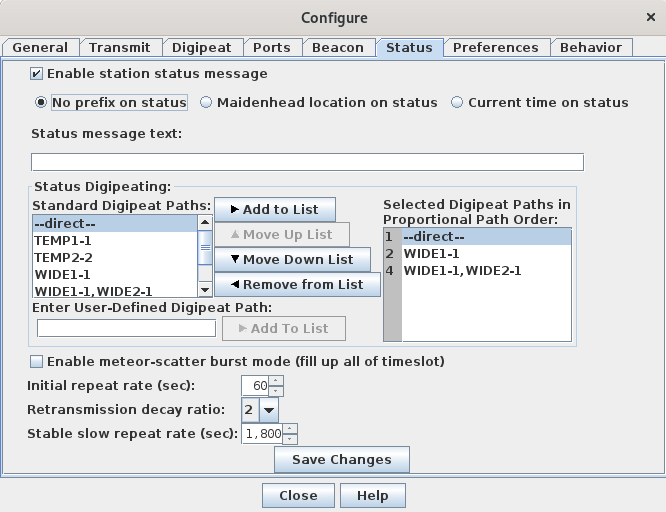 Several standard choices are provided (including the path of no digipeat aliases at all), but other custom paths may be entered in the User-Defined Digipeat Path text field. If more than one path is selected, they will be used alternately by the proportional pathing algorithm (each lower path used half as often as the path before it). What transmission intervals the status message should be transmitted at. This overrides the application-wide defaults set on the configuration dialog's Transmit tab. Note that if a port the status message is being transmitted through is using timeslotting, the transmit will not actually occur until the next timeslot after the scheduled status transmit time. None of the changes are stored until the Save Changes button is pressed.